I am employed again! Which is great and means I can lash out and buy the quality butter, which is also good because did you know Melting Moments (aka Yoyos) are mostly butter? Well, you do now. Just like pastry, which I’ve come to realise is essentially butter, with just enough flour added to hold it up. I needed to bring something into my new workplace that was pretty and good to share (I seem to have a reputation to uphold), and people tend to go gaga for Melting Moments even though they are so so easy to make. Are these the CWA alfajores? Makes between 16 – 24 cookies, depending on how big you want them. I like them small. Make sure butter is nicely softened. Put in mixing bowl with the sugar and custard powder and beat with electric beater for a few minutes. Scrape beater down then add flour gradually with a wooden spoon, and your fingers once it gets too hard to stir. Once you’ve mixed it together as much as possible make it into a cookie dough by pressing the mix together with your hands. Put into the fridge for about 10 minutes. Wash hands with cold water, remove dough from fridge. Take small pieces of dough and roll between hands to form a ball (the diameter should be about 1 to 1 1/2 cm) and place on a lined baking tray with room between each for growth. I had to do three trays’ worth of cookies. 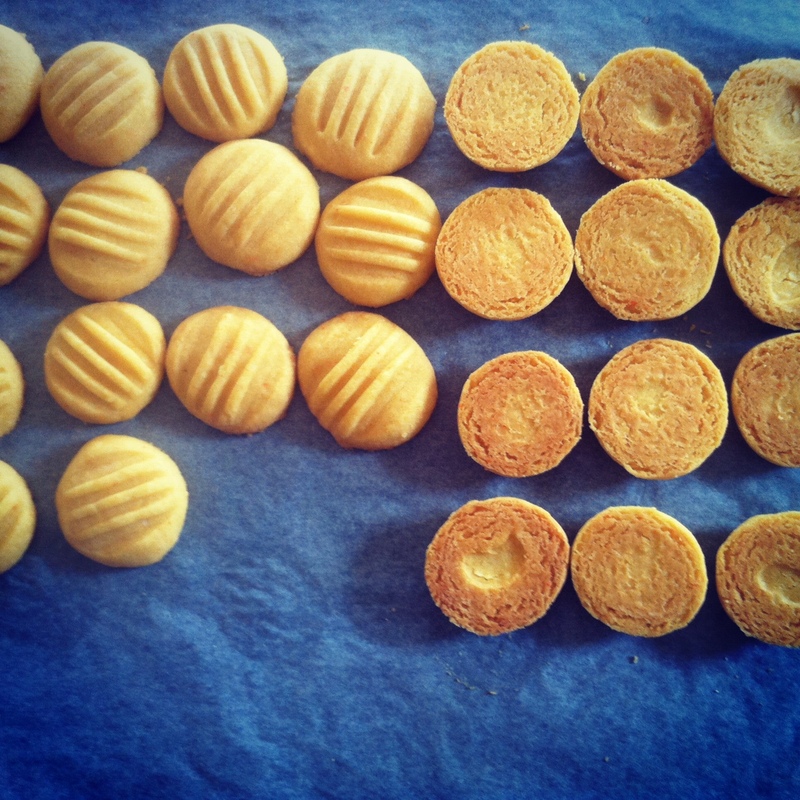 With a fork dipped in icing sugar (this is very helpful), press down on each cookie gently to flatten it. Place in oven and bake for about 20 minutes. You want to be taking them out before they get any golden-brown on the edges. Let them cool entirely before icing. Start with small amounts of the butter and lemon juice added to the icing sugar and work your way up, you want a stiff consistency. If you are using pure icing mixture and there’s lots of lumps you can do the sensible thing and sift it in, or the lazy thing (like me) and just beat the mixture firmly until the lumps of sugar are gone. As the biscuits are quite crumbly (a good thing!) I find it easiest to ice them thru a piping bag rather than spreading it on. I don’t actually have a piping bag though, so this is what I do: Turn half your (cooled) biscuits over, fill a ziplock bag with the icing, zip it up, cut a 1/2 cm hole in one of the bottom corners of the bag, and squeeze the icing onto each flipped cookie, and gently sandwich with a “top” cookie. Congrats on being employed! I do like your description of the melting moments as the CWA alfajores! It sounds like I’ll have to start reading some Stout, I love food in fiction. 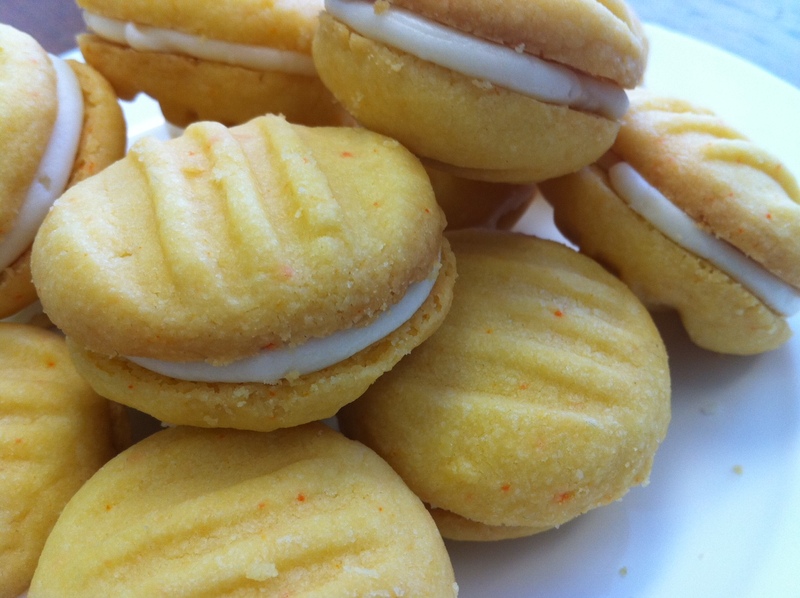 You are currently reading Melting Moments (are easy) at And Lashings of Ginger Beer.